Good morning. I am most delighted to join you today at the Hong Kong Computer Society's flagship annual event - the Hong Kong International Computer Conference 2018. Indeed, I take great pleasure in attending this annual event. 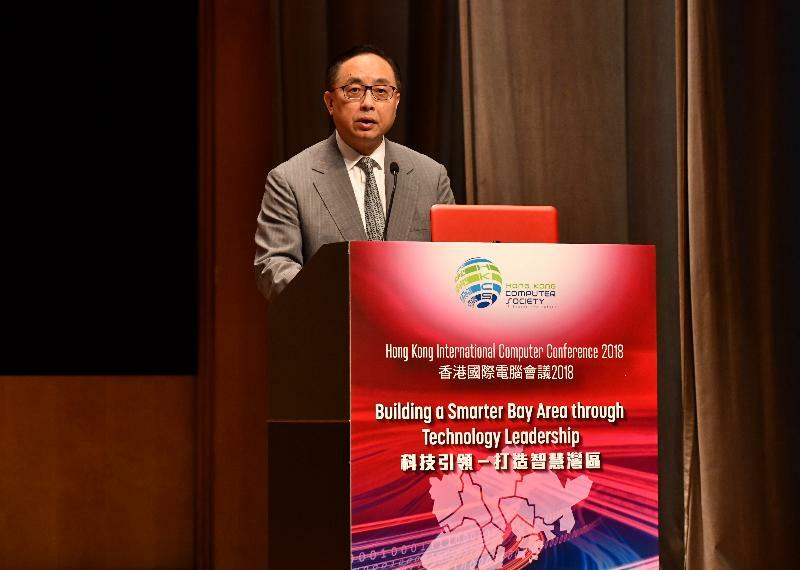 Not only can I connect with friends of the ICT industry, it is also a timely occasion for me to share with you Hong Kong's latest developments in innovation and technology (I&T), the timing of which often ties in with the Chief Executive's annual Policy Address. Last month, the Chief Executive delivered her second Policy Address announcing further initiatives on I&T in addition to the eight major areas set out in her 2017 Policy Address. Thanks to the concerted efforts of various parties inside and outside the Government, we are making good progress in these areas. To keep up with the momentum, we are pressing ahead with new measures as well as additional investment to propel I&T development in Hong Kong. I would like to highlight some which should be of interest to all of you. As you may know, the Government is devoting its efforts in delivering over 70 smart city initiatives in the six areas committed in the Smart City Blueprint released last December. One area is to accelerate Smart Government. We will spare no effort to enhance the Government's own capability in adopting new technologies in our services. The Office of the Government Chief Information Officer (OGCIO) will set up a Smart Government Innovation Lab in April next year. Through this lab, local start-ups and small and medium-sized enterprises (SMEs) will be invited to put forward proposals on I&T applications and product suggestions for use in public services. We aim to bring in local innovation to help government departments address various new and persistent city challenges such as municipal and environmental problems, crowd control, cargo clearance and other urban issues. Trials and technology testing will be conducted jointly with relevant government departments. Innovative measures could be formulated more effectively to improve the delivery of public services. This will also create more business opportunities for local start-ups and SMEs. It will be a team effort by the Hong Kong people and the Government. In addition, we will allocate $500 million for organising an annual City I&T Grand Challenge in the next five years to promote the use of I&T in addressing livelihood issues. I welcome all of you to participate and contribute to identifying I&T solutions to help tackle issues closely related to the public's daily living. Last year, we rolled out the $500 million TechConnect (Block Vote) to support government departments in planning and implementing technology projects to enhance operational efficiency and improve public services. We have supported over 40 projects, 24 of which have already commenced. These projects involve different technologies, for example artificial intelligence, Internet of Things and big data. As announced in the Policy Address this year, another $500 million will be allocated to the TechConnect to continue to drive the adoption of technology by government departments. The above are just some of the latest measures we have put forward to enhance public service delivery and facilitate the development of the local I&T industry. I encourage players and leaders in the industry to take these opportunities and work together with the Government. Let's work together to make our local innovation shine in our public sector. Today's theme "Building a Smarter Bay Area through Technology Leadership" certainly reflects the challenges as well as opportunities ahead for Hong Kong. The Government has been actively participating in the Guangdong-Hong Kong-Macao Greater Bay Area development and our vision is to develop the Bay Area into an international I&T hub. I believe the distinguished speakers of this conference will share with us more insights on this topic. As the saying goes, "Alone we can do so little; together we can do so much". Through our joint efforts, I am confident that we can bring Hong Kong onto the next level of prosperity and success. Last but not least, I would like to congratulate the Hong Kong Computer Society on organising yet another successful ICC. I wish you all a fruitful and rewarding exchange and experience at the conference. Thank you.